Everywhere we travel people proclaim “the best food is the food cooked at home!” Although we never really get the chance to find out, there have been a few countries where we hope that this is true, since the restaurants could be so bland and boring. 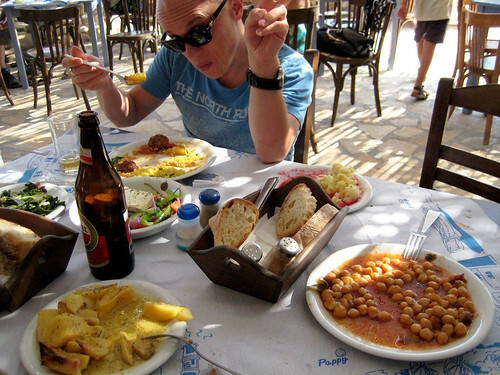 You know who you are, we aren’t going to name names… The good news is that the Greek islands are the kind of place you actually get to eat “family” food cooked with lots of love and flavor. The price of the food has little to do with the quality, use your keen senses to find the restaurants with the right vibe: a homely but lively and filled with locals. 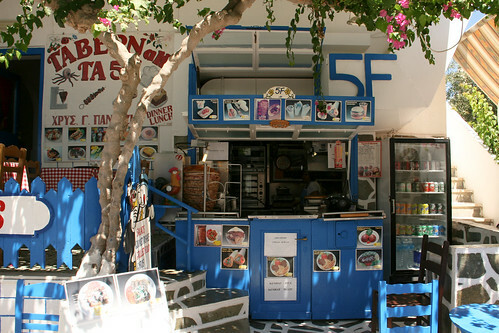 Our favorite places to eat in Greece were always these little restaurants and tavernas where an entire family worked day and night. Mom would be up before 5 am making the food, the daughters were the waitresses, and the surly son would run the cash register while chastising his sisters for their lazy and/or slutty ways. It was like watching a Greek soap opera, only you get fat faster than a couch potato. The real star of the show was the food. Though made in advance, this was the kind of food that only got better the longer it stands around. Oils and juices continued to mingle with spices and herbs, meat became more tender while rice and vegetables took on more depth and flavor. 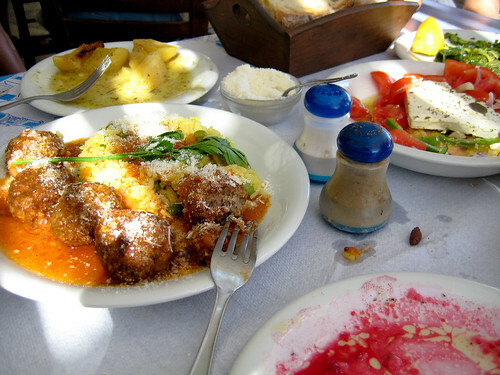 Do not distrust a taverna in Greece with a display case full of food, it has been growing in complexity and depth of flavor, wholly unlike American food under a heating lamp. Menus meant nothing to these restaurants. Whatever mom had made that morning was what you could eat that day, and going back to the same restaurant meant you rarely ate the same food twice. We don’t even know the name to most of the dishes we had. 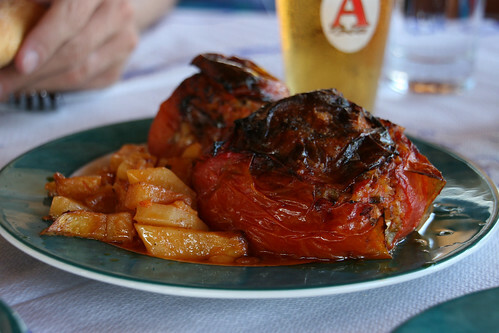 There were roasted tomatoes stuffed with meat and vegetables, tender meatballs laced with cheese, grilled eggplant, salads made of chickpeas, peas or potatoes, all mixed with wonderful herbs and floating in some of the most flavorful olive oil we have ever tasted. 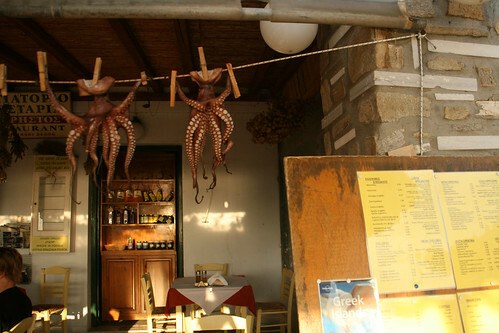 Octopus was left in the sun to dry and then grilled to perfection. We once had a Moussaka so thick with Bechamel sauce you can feel it giving you a coronary. 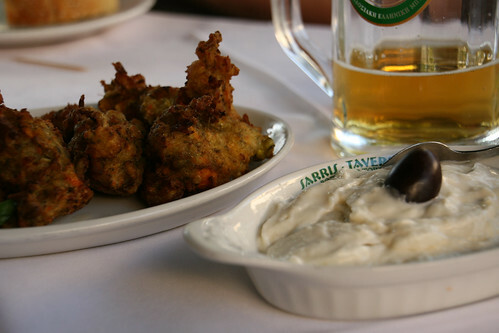 The only Greek food we really knew by name were the dips and we loved them. 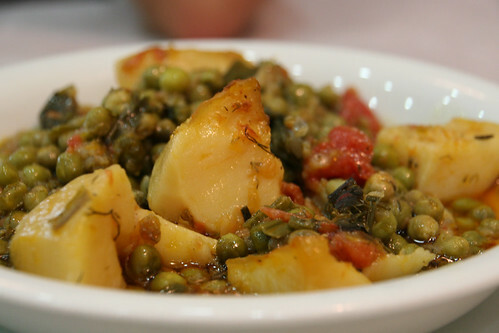 There is nothing that will ruin your appetite for dinner as an appetizer. We were filling up on bread with tzatziki (yogurt, cucumber and garlic), taramosalata (fish roe, potato or bread crumbs, lemon juice and olive oil) and skordalia (garlic, potato and olive oil). 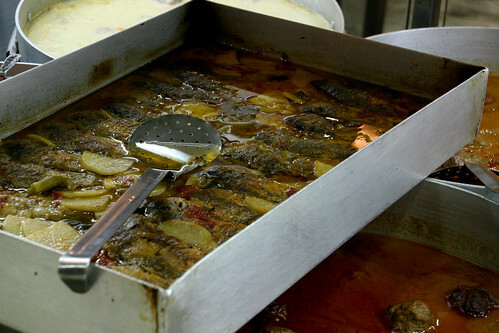 Though not actually a dip, we found saganaki (fried cheese with herbs – sometimes flaming) just as addictive an appetizer. 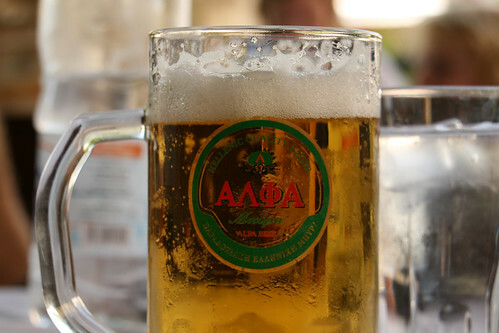 All washed down with a cold Mythos or Alpha — Greek names for beer if ever there was one. They also serve Amstel, the beer of Amsterdam, but we are devotees to local beer. 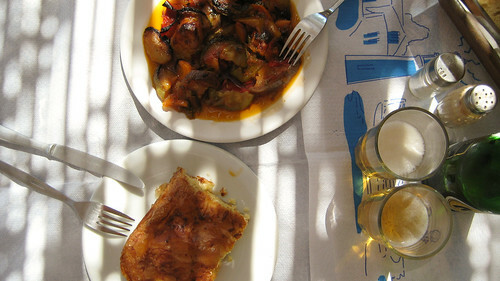 Most often it is brewed to accompany the local food better than any other beer could. 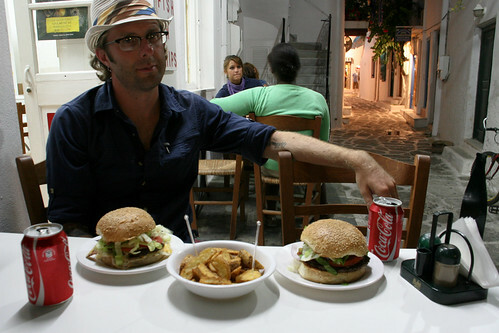 You can find plenty of fast food, even on the small islands. 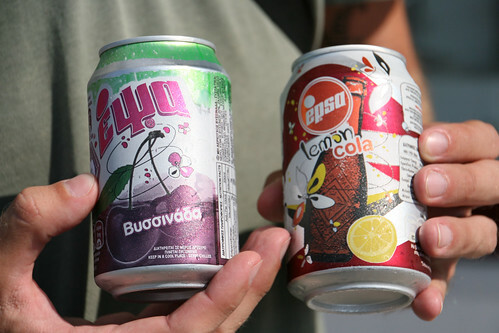 They serve the universal fast food: Soda (strangely Greek? 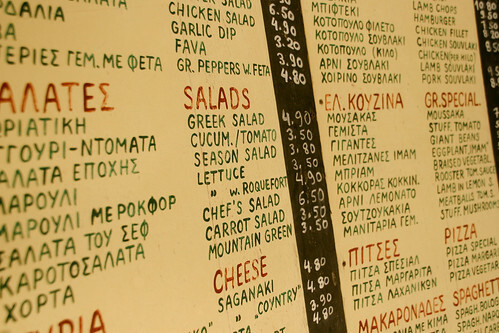 ), french fries, the hamburger (whose origins have been long lost to multinationalism), and the Greek handheld (version of the hamburger) known as a Gyro. 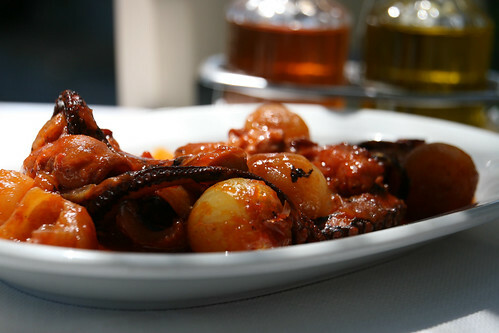 The food may be good but it will never compare to the home cooked fare of a family run taverna. 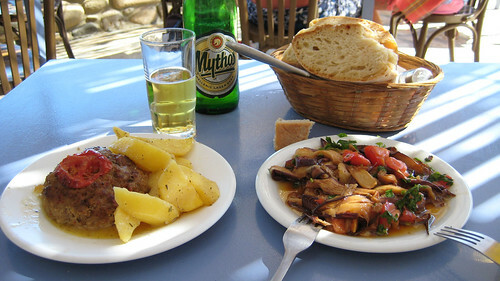 Ahhhh…the food of Greece still has my heart. I have, so far, not found anywhere where the food is better. Your pictures do it justice!! 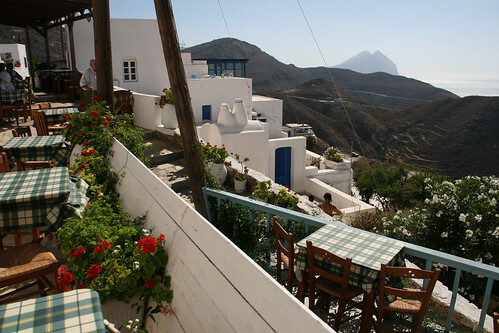 I love Greek food, especially when eaten beside some kind of body of water. 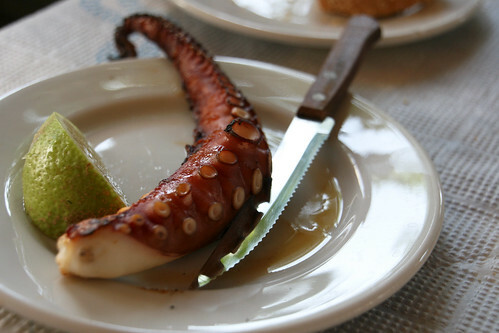 The sea spray seem to make their seafood taste better I love Greek-style octopus! I love Saganaki, too. I am so glad that I ate dinner before reading this post – and coincidentally, dinner was homemade Greek meatballs and tzatziki. 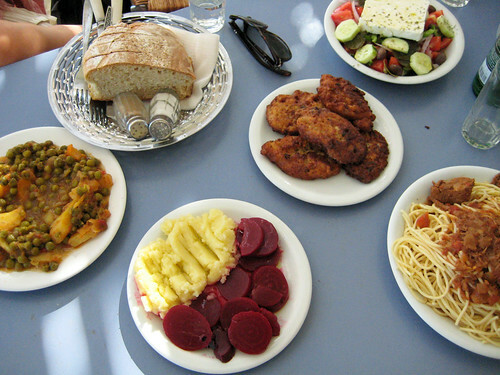 I loved getting to point at trays of food before tucking into a perfect taverna dinner. 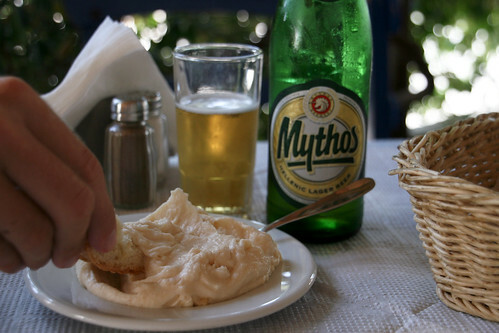 I don’t miss the Mythos though. It was only good because it was cold. We’d say Vasili’s is the real deal — still some of the best skordalia we’ve had!